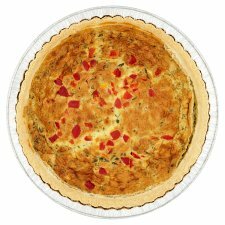 Red pepper, spinach and feta full fat soft cheese baked with free range eggs and cream in a shortcrust pastry, topped with diced red pepper. 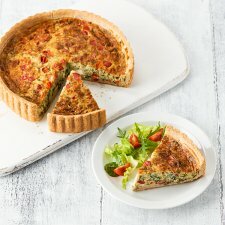 Deliciously crumbly shortcrust pastry encasing a light spinach and crumbled feta quiche, enriched with cream and topped with red pepper. A great vegetarian alternative, perfect for buffets and summer picnics. Serves 8. Shortcrust Pastry, Cheddar Cheese (Milk), Pasteurised Free Range Egg, Skimmed Milk, Red Pepper (10%), Spinach (7%), Feta Full Fat Soft Cheese (Milk) (5%), Single Cream (Milk), Cornflour, Salt, White Pepper, Nutmeg. Instructions: For best results oven heat. Place on a baking tray in the centre of a pre-heated oven for 30-35 minutes. Remove all packaging including foil tray.